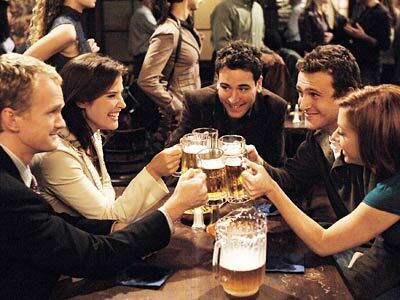 One of the reasons I like the television show “How I Met Your Mother” is that it often imaginatively plays around with notions of fate and time—if this didn’t happen here at this particular moment, then that wouldn’t haven’t occurred there at the time it did occur there. A riff on Chaos Theory, I suppose, and the good old Time/Space Continuum, seasoned with serendipity. Kind of how I felt after the fourth hole today on the Tom Fazio Premier course at Treetops. Consider that after our morning round at the Signature course the Golf Road Warriors barely paused for a quick bite in the clubhouse and an interlude with our videographer, David Whyte, before heading straight onto the Premier. I started off with a bogey, wasted a lot of time on the second until I picked up, parred the third, and took aim on the par-3 fourth as the beverage cart girl hove into view. I launched a tremendous shank off into the weeds, just as the cart girl pulled up to our group. Now, had we not done the video in one take, or had we dawdled on the first tee–or if we had played more quickly, if I had had a speedy bogey instead of a poky 7x on the second hole, then I might not have shanked the ball at all, of course. (See my thoughts on the Theory of the Predetermined Hit here.) But even if I had, it might have been at a different time, with no cart girl in sight. Even I had to laugh. No mean feat, since a shank is the most devastating shot in golf. My fellow Warriors were prepared to treat the dreaded spectacle with the lugubrious, crepe-hung silence it deserved. But, “Hi, how are you guys doing today?” let the floodgates loose. In truth, we were all doing just fine. Peter Kessler had taken the afternoon off, but filling in was Michigan golf writer Terry Moore–a Golf Road Warrior comrade from the Scottsdale campaign. Brian McCallen and I opted to cut the round short and make it only a 27-hole day. But we did drive around to see the rest of the course, and how Fazio pretty much let the floodgates loose here, too. As Bandon Dunes developer Mike Keiser has said about golf courses: “One plus one equals three.” Add one course to another in a locale, and you don’t just have two courses, you have a golf destination. 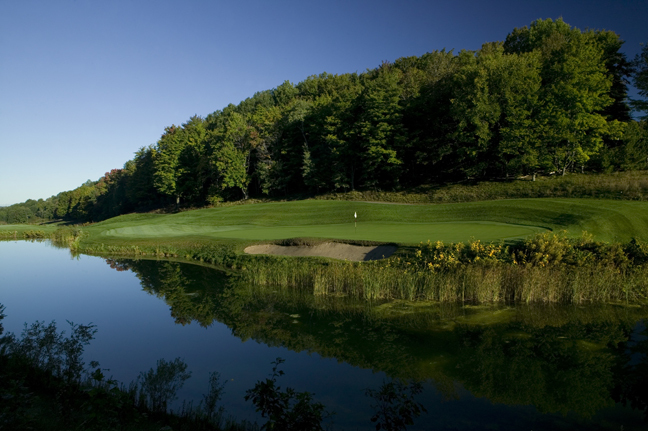 So it was for Treetops after the Fazio course opened in 1992 and created a new synergy for the resort. It’s not hard to see why. 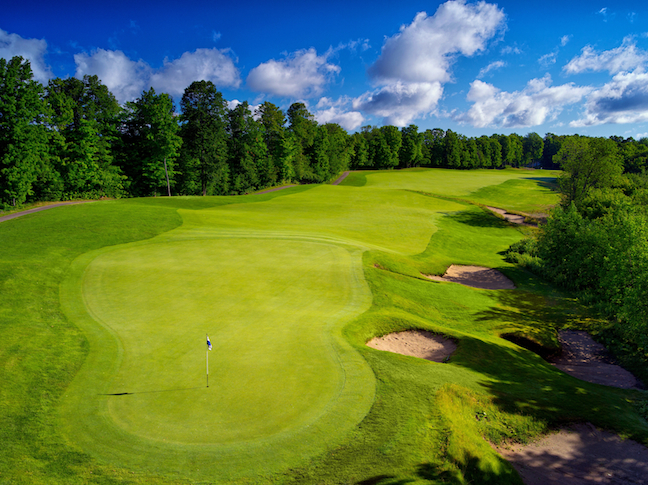 Fazio, on his only course in Michigan, made full use of the rolling hills at his disposal, a roller coaster ride best exemplified by holes seven and eight. The former supplies a downhill chute to a narrow fairway, though it’s no guarantee you’ll land in it. David Whyte’s video suggests my tee shot was right next to the cart path. Actually, that was my lie after my second shot from the woods. 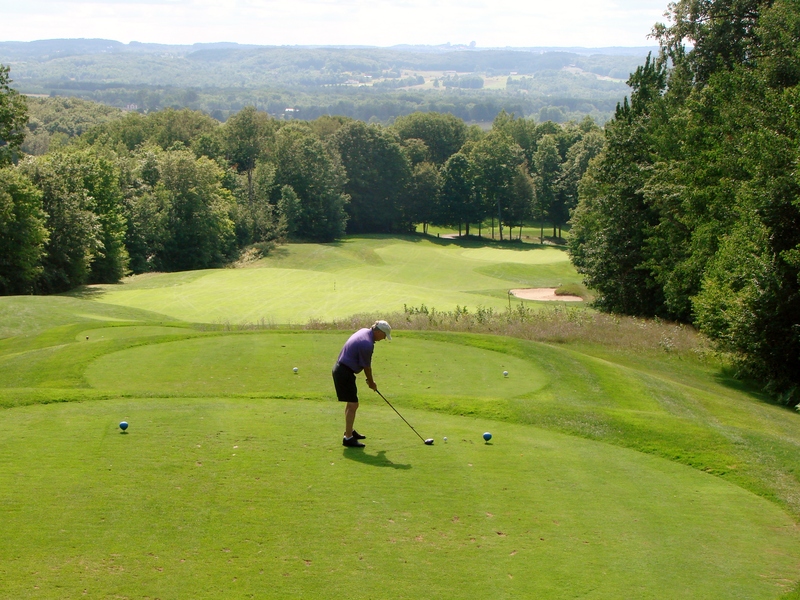 Once in the fairway, your approach will be an uphill shot requiring one to three extra clubs, lest your ball roll all the way back down the formidable slope in front. By contrast, the eighth is a dramatic downhill par-3 (playing about 142 yards today), although with another opportunity to fall short of the green and have your ball toboggan down the hill. On our tour of the back nine Brian had a call from home to deal with, so as we paused at the par-3 eleventh, playing about 160, I pulled out a six iron to try out the only water hole we’d seen all day. Actually, I gave it a try twice, quickly lightening my golf bag by the weight of two balls. As we came around the bend to a tee box a few holes later, we paused as a foursome hit off. “Ah, I knew I smelled cigar smoke,” I said. “Want one?” said one of the players who was puffing away. Well, it’s all about the timing. If I hadn’t hit that shank, hadn’t convulsed when the cart girl chimed in, hadn’t rinsed two balls at eleven, I wouldn’t have been slipping a cigar in my pocket when I did. It all made me very thoughtful. And I was thinking the timing seemed just about perfect for a beer at the Treetops Sports Bar.